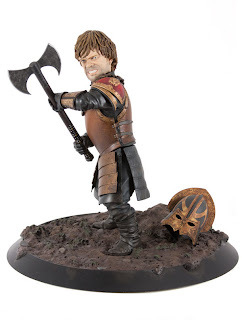 Played by Peter Dinklage on the show, the 10" statue of fan favorite character Tyrion Lannister is based on his defense of King's Landing in one of the most crucial scenes of year. Dark Horse wanted something impactful for the piece, and they got it- coming to that point though, wasn't the easiest. You might imagine that working with an entertainment company as big as HBO might not be the greatest experience. Not the case according to Dark Horse's David Scroggy. Always cool to hear something like that isn't it? Now, f you can't wait to get yours, Tyrion here is going to be very limited in availability (though it's not yet been set how limited) and is now available in advance preorder. He clocks in at 10" high and 9.5" across at the base. This hand painted and numbered collector piece will ship in a full color carton and is expected to be released on February 20th, 2013 for $199.99.